Immunel™ is a unique immune promoting ingredient that can serve as a useful tool to strengthen and maintain the balance of a healthy immune system, keeping it ready for when resistance support is needed. Immunel™ is a concentration of specific immune factors from colostrum, clinically proven to induce rapid changes in immune function... within 30 minutes to 2 hours. 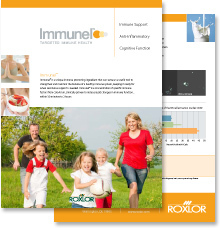 Immunel™ acts as an immune-modulator, re-establishing balanced regulation of the immune function by restoring the cytokine communication pathways by utilizing the immunoactive molecules that are extracted from dairy cow colostrum. Immunel™ has been studied to induce an array of immunoactive molecules essential to immune system communication. Immunel™, because of the small molecular size (10,000 kilodaltons) is capable of transferring a cellular immune response and optimizing immune system response and balance. The direct effects of Immunel™ on separate aspects of our innate immune defense were tested using human polymorphonuclear (PMN) cells. The pre-treatment with Immunel acted almost immediately, and within a few minutes after treating phagocytic cells with Immunel, more cells were phagocytic, and each phagocytic cell consumed more particles. Natural Killer (NK) cells are another type of immune cell that is able to respond immediately to invading pathogens. These cells are able to attack cells that have become invaded by viruses, or other pathogens. Treatment of NK cells with Immunel resulted in an activation of the NK cell. The treated NK cells expressed much higher amounts of an activation marker called CD69, which indicates that the NK cells were activated to be more efficient at attacking target cells.